YouTube VR is one of many apps curated to be used with Daydream, Google’s new virtual reality platform. A quick recap on Daydream: the platform consists of YouTube’s newly designed VR headset and remote control which when applied, allow the user to step into a 3D world that in some cases can even be interactive. Daydream is a progression from Google’s previous VR endeavor, Google Cardboard, which as the name describes is a virtual experience based around a cardboard VR headset. With Daydream, the technology is smoother and the headset itself has evolved into a soft, lightweight material, making the whole engagement more comfortable. The purpose of the new YouTube VR app is to let you view any YouTube video using Daydream, making every video a potential VR experience. The key word that YouTube uses to describe the app is “immersive.” Videos that will particularly enjoy the benefits of YouTube VR are those filmed in 360-degrees. With the integration of 360-degree stereoscopic videos with positional audio into YouTube VR, 360-degree videos will be even more interactive. This means that when using Daydream, you could be “immersed” in a virtual reality where you can see a simulated world from a multidirectional perspective and can even have sounds coming from different directions, making the whole experience that much more realistic. The app can only be used with Daydream compatible smartphones, which currently include some of the latest Android models as well as the Google Pixel phone. Regular videos can also be viewed through Daydream and while the videos won’t be interactive, they will be displayed via a virtual theater layout. With all distractions blocked out by the Daydream headset, these traditional YouTube videos now have the potential to be consumed in a much more riveting way. In addition, the app utilizes some features previously available via other YouTube products — such as voice search — and maintains the usual YouTube interface, allowing you to access your subscriptions and various personal feeds when signed into your account. 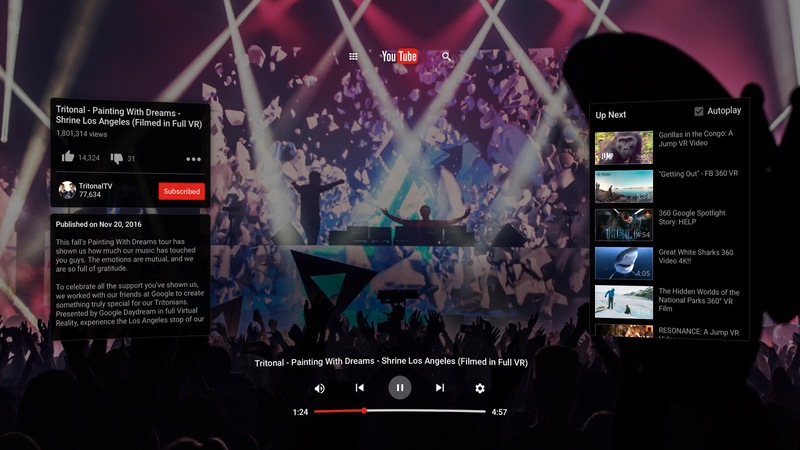 Similar to existing YouTube products, the YouTube VR interface allows you to keep videos playing in the background while you search for new videos or review account activity. The big difference is that the whole interface is displayed through the Daydream headset with display screens and interface options suspended in thin air in front of you, giving the hub of the app a multidimensional perspective. As a creator, YouTube VR lets you make YouTube videos more compelling. Maybe now, instead of a band just creating a behind-the-scenes video of their tour, they can create a 360-degree video that chronicles the setup of their gig from start to finish, making fans feel like they are at the center of the pre-show adrenaline. YouTube is already working with a multitude of different creators to construct VR videos that can be used with the new app. They are even giving creators with more than 10,000 subscribers the opportunity to use their Creator Spaces, cameras and technology to assist in the creation of 360-type videos. It’s apparent that YouTube sees the possibilities with VR-based videos; it’s now up to the creators to make these amazing technological advances worthwhile for the viewer. While virtual reality is not the real world, one thing is clear, with the help of YouTube VR, YouTube is making that brief escape into a simulated world even more believable.